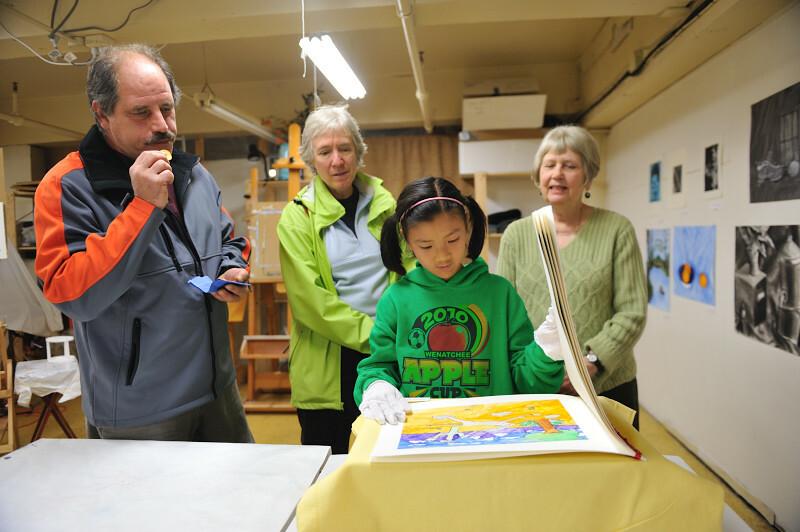 Tacoma Studio Tours: November 5 & 6! 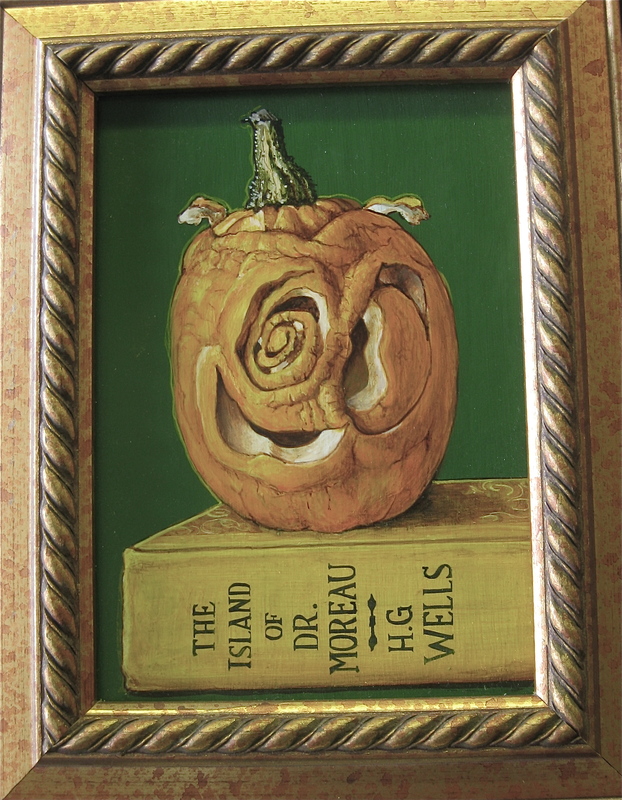 Today is the last day of October, which means that Art at Work Month starts TOMORROW! Enjoy Halloween tonight (take some You’ll Like Tacoma pictures with the best costumes you see and send ’em in! ), and get ready to get your arts on for the rest of the week. Kick off officially with us on Thursday evening at our Opening Party at the Museum of Glass! Studio Tours 2010. Photo by Jason Ganwich. Can’t get away until the weekend? That’s okay! Join us and 57 local artists on Saturday and Sunday from 10:00 to 4:00 for the 10th annual Tacoma Studio Tours. This year, the 57 artists will open 37 studios to the public (some are group studios), giving everyone a chance to see where and the techniques and tools they use to create their masterpieces. It’s also a great way to ask artists questions, see the creative process, and purchase one-of-a-kind local art. 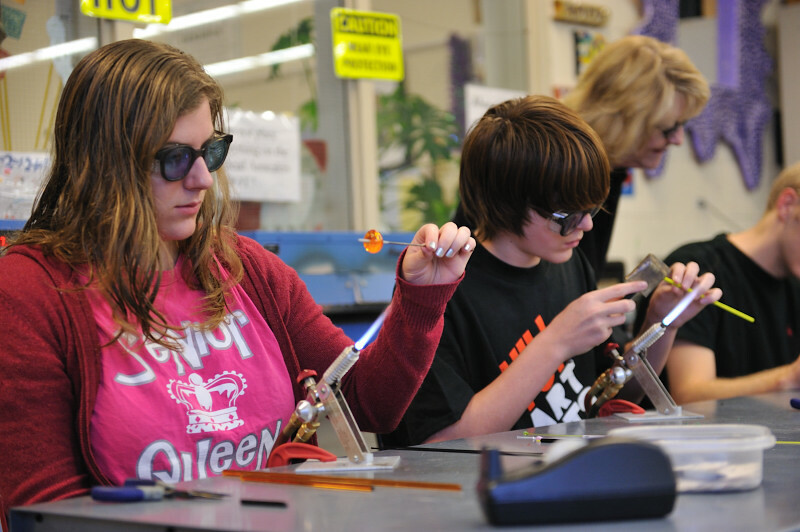 This year, all of the studios will offer a demonstration or a hands-on activity for visitors! Most will be kid-friendly, so bring your family and try your hand at stone carving, sumi painting, linoleum block printmaking, and more. Some studios may even let you come away with a little free keepsake, to help you remember your experience at the Studio Tours this year. Her keynote alone will make it worth your while! Some of the other sessions we’ll be holding this year include Marketing with Social Media, Fund Your Projects: Grant Writing for the Visual, Literary and Performing Artist, Engaging with Youth in the Arts, and Public Art Perspectives. For a full list of sessions and their descriptions, visit the Symposium page at www.ArtAtWorkTacoma.com. Tip #1: There’s a lot going on, so make sure you don’t sign up for overlapping sessions! 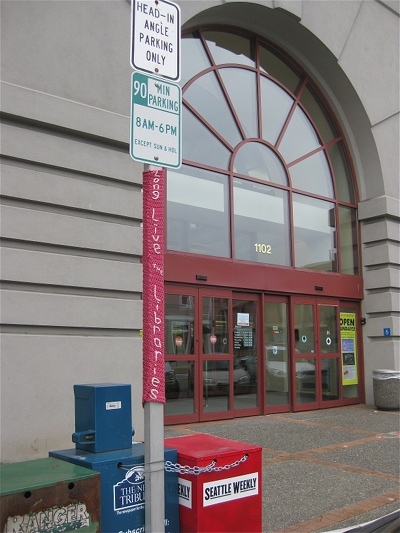 An anonymous valentine to literacy: yarn graffiti outside the main branch of the Tacoma Public Library. Yes, we love our public library, its friendly and knowledgeable staff; the wonderful range of free services it provides (check out the teen StoryLab on the main floor – wow); the magnificent Northwest Room and Special Collections upstairs; the Handforth Gallery; its citywide bookclub, Tacoma Reads Together); and so much more. TPL headquarters is the most appropriate of places for a secretive visual artist to come spin an original yarn. Original booty by Art Chantry. We were a little beside ourselves waiting to see the official 1oth anniversary Art at Work swag created by noted designer Art Chantry. Chantry is legend in these parts; his poster art was plastered all over Seattle during the glory days of punk rock, and later, grunge (he designed album covers for Hole and Nirvana). He is known for art that scratches the eyeballs and cerebral lobes with its rough graphics and text collaged together in unexpected, sometimes shocking combination. It’s art that announces itself with a scream, not a whisper. Currently, a retrospective of his work, Parkland is Burning, is on exhibit at Fulcrum Gallery through November 17. 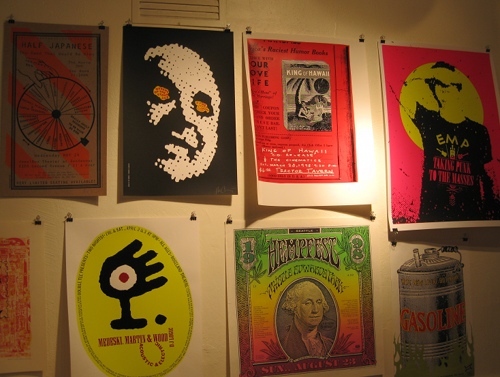 Rock posters from "Parkland is Burning" at Fulcrum Gallery. To celebrate Art at Work, Chantry took a different tack. He chose retro imagery, a local mantra (“You’ll Like Tacoma”) and a vintage palette to adorn keepsakes that bespeak an earlier chapter of T-town history. The objects possess a simple, gritty sweetness, much like our hometown. Our favorite is the “floaty pen,” in aqua or black, featuring a woman diver jackknifing into clear, vertical depths. But there’s more – refrigerator magnets, rub-on tattoos, keychains and posters – all featuring iconic images such as drive-in signs and diesel-wheezing trucks from Tacoma’s rough-and-ready past. Don’t miss your chance to celebrate Art at Work’s 10th birthday with a free keepsake by Art Chantry. The artist’s work has graced the walls of the Seattle Art Museum, the Smithsonian, the Louvre, MoMA, and the Rock and Roll Hall of Fame – wouldn’t you want it casually laying around your place? 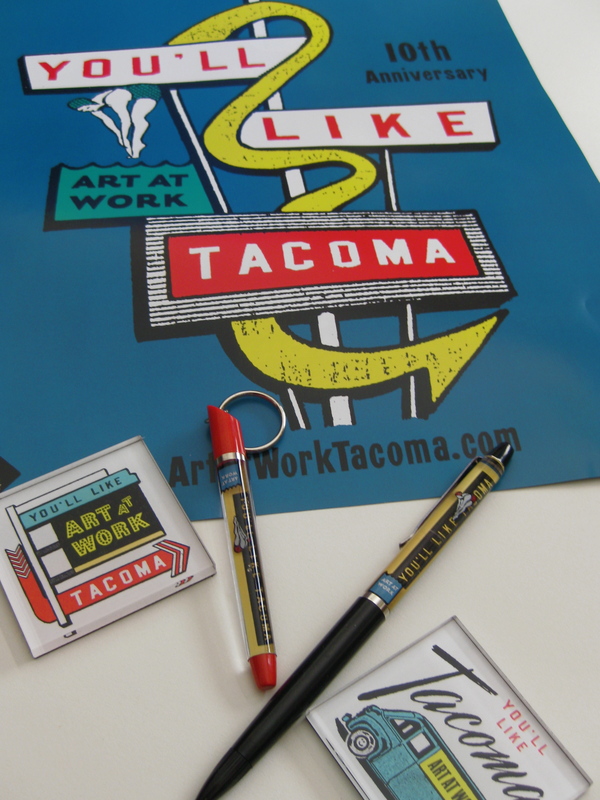 The swag will be available at the Art at Work Opening Party on November 3, 6-8:30p.m, at the Museum of Glass. Very limited quantities will also be available during the open-studio tour, November 5-6, at participating artists’ studios. Chantry will give an artist’s talk tonight, October 20, at 6p.m. at Fulcrum Gallery, in conjunction with his show, Parkland is Burning. 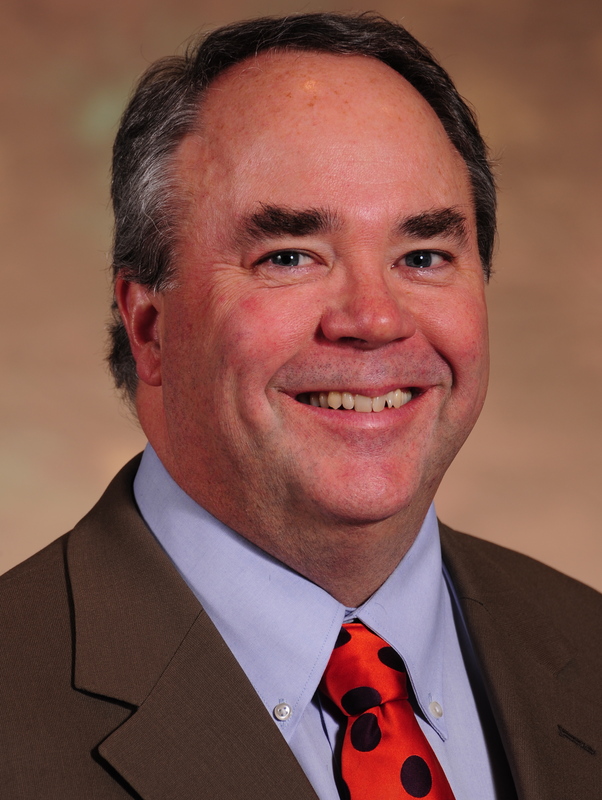 When the Broadway Center Board of Directors chose David Fischer as their new Executive Director, in 2006, Fischer took on a mandate to completely re-engineer the organization. And the results have been stellar: Under his team of revitalized staff, Board and volunteers, the Broadway Center has tripled its audience. It is the provider of Washington state’s largest, most dynamic arts education program, and its portfolio includes serving as manager of Tacoma’s Theater District and its historic anchor venues – the Pantages, the Rialto, and Theatre on the Square. 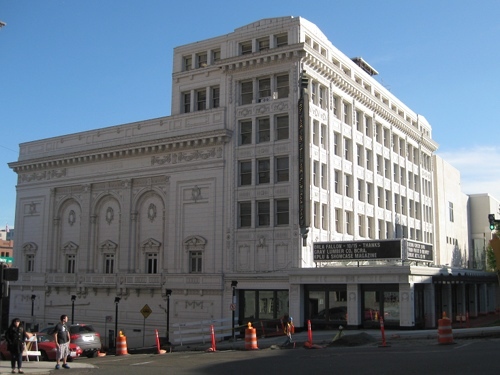 The Broadway Center’s guiding vision has been “to lead and energize the renaissance of downtown Tacoma,” and to make the performing arts as accessible to the community as possible. “[That focus] hasn’t wavered,” says Fischer, “to be relevant and meaningful to the broadest base of our community and make a difference to the social and economic fabric of Tacoma.” So impressive has been his leadership that this year the Tacoma Arts Commission created a new category of the AMOCAT Awards just to honor him; Fischer is the recipient of the first AMOCAT Arts Leadership Award. From the beginning, Fischer declared diversity and access to be the heart of the Broadway Center’s future. An important factor has been to achieve the difficult balance between bringing high-quality performances to town and offering “broad access to the community regardless of ticket price.” Though artist fees for Queen Latifah, Lyle Lovett, kd Lang and Buddy Guy demand that the intimate Pantages Theater ask for high ticket prices, a broader access was leveraged through a tiered pricing program ensuring that a minimum of 10% of every house be significantly reduced in price (usually 60% less than the top price). WHEN: Saturday, Oct. 15, at 2p.m. Built in 1833, Fort Nisqually was a Northwest trade center, a Hudson’s Bay Company outpost and the first European settlement on Puget Sound. Nestled in the woods at Point Defiance Park, it offers inspiring surroundings for the writing – and reading – of poetry. Back in July, Tacoma Poet Laureate Josie Turner chose it as the setting for her poetry writing workshop, Place and Persona. This Saturday, workshop participants will return to the Great Room in Fort Nisqually to read the poems they’ve written after spending time in this beautiful and historic place. Poets include Chelsea Wiggins, Connie Walle, Emilie Rommel, Marjorie Rommel, Risa Denenberg, and Sally Riewald. Turner will also present Pagoda, a poem she wrote in response to the burning of the pagoda at Point Defiance Park, illustrated by William Turner and recently published as a broadside by Springtide Press. During Art at Work Month in November, Turner will lead a workshop on writing poems in response to paintings. Are you part of an organization that wants to offer some arts programming in the coming year? Apply for the 2012 Arts Projects funding! We are now accepting applications from eligible organizations that will produce publicly accessibly arts programming in 2012. The program can provide between $1,000 and $5,000 for your community project focused on the arts. A scene from last year's Proctor Arts Fest. Image is a TNT courtesy photo. Past funding has supported projects like dance and musical performances, workshops, literary events, and arts components of festivals. Make sure your organization and your arts programming are eligible for funding before you apply – read through the guidelines carefully! If you have any questions about the Arts Projects, or about the application process, we’re holding a free workshop to answer all of those questions. It will be held on November 1 from 12:00-1:30 p.m. at the Tacoma Municipal Building (747 Market Street – Room 1444). You can get additional information and download the guidelines and application by clicking here. The deadline is November 28, 2011, so don’t procrastinate on this one. Good luck, and we’ll see your organization’s arts programming in 2012!